What’s Your Favorite Video Game World? A few weeks ago, Kotaku’s community-run blog, TAY, had a theme week with a question, what is your favorite video game world? 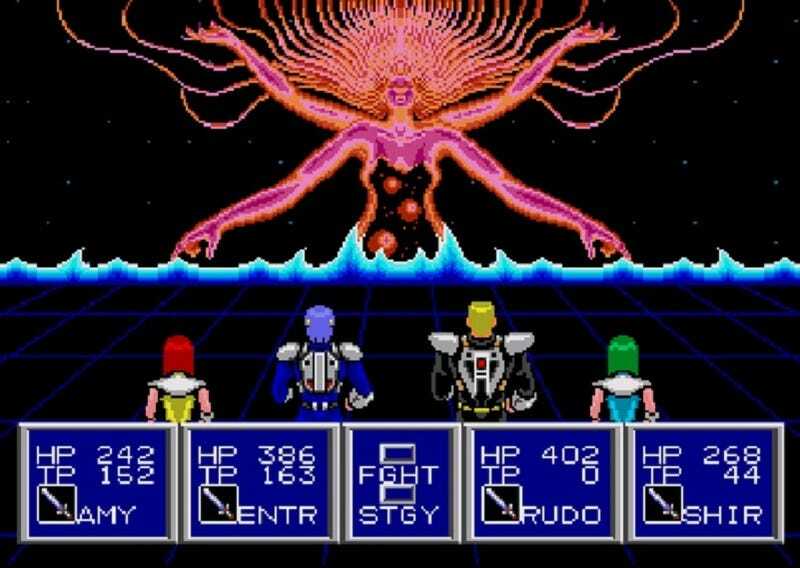 I’ve always loved the world of Phantasy Star II. It’s a utopian vision of a future where everything is provided for. A big AI computer called Mother Brain has created peace and harmony in the world. The weather is perfectly regulated. No one needs to work anymore. Hunger has been eliminated. The main problems the citizens face are what to do with their free time. Even though ultimately, all hell breaks loose and the seeming order falls apart into a nightmarishly human-caused chaos, the ideal it represents is awesome. Plus, I could never get over the fact that it was your own actions, precipitated by the sabotage of Nei First, that spark the end of paradise. Then again, even Adam and Eve brought about their own exile by eating from the forbidden fruit. The save state system uses a really clever device that reminded me of the Culture books by Iain M. Banks. Rather than magical recordings, they are data storage units where you actually download your memories up to that point in a literal information dump of all your experiences. So at any time, if you venture into an area where the biomonsters or robots are too hard and you get killed, no problem. They’ll upload your old “save stage” up to that point, feed that information into to a clone. Yes, clone, as there are no miraculous resurrections. That means game over when you die. Reload, the Sega logo comes up again, followed by a darkness, then catchy upbeat music and a data storage specialist that confronts you with your temporary flirtation with mortality. They then upload all your old memories into a new clone. The science fiction elements used to explain the basic JRPG mechanics were fascinating, and in a sense, eerily comforting. Immortality wasn’t just some magically esoteric concept, but a science fiction fueled possibility. With every year that goes by, I realize time is way too short. There are a thousand books I want to read, a thousand games I want to play, a thousands places I want to visit. But whereas a few years back, I felt like I had all the time in the world, every passing year reminds me that the sense of timelessness I used to feel is an illusion. I can’t just store my data in a save state and clone myself as needed. I don’t think we’ll get to a point (at least in my lifetime) where all of my knowledge can be stored on a disc? With advances in biomechanics, will clones be commonplace in the future? What would be the quandaries in a post scarcity economy where people can pursue what they’re passionate about without having to worry about the financial feasibility of their endeavors? But as always, humans ruin everything. Greed destroys the perfect balance of Mota in Phantasy Star II and discrimination against Neifirst leads to the destruction in the Biolab. The utopia shatters into a long dark era known as the Great Collapse. It would take a thousand years for them to recover, and even then, things would never be the same. The “phantasy” was over. The question today, Kotaku readers: What’s your favorite video game world?